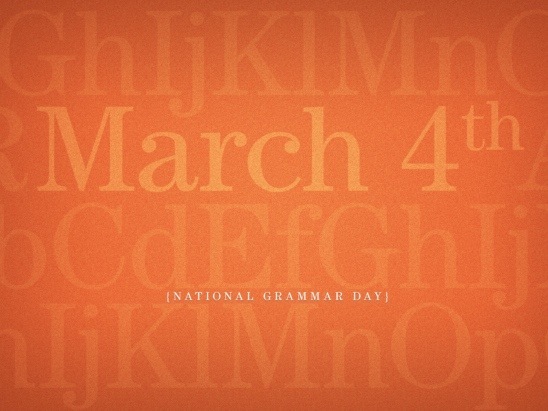 One of last year’s free National Grammar Day wallpapers from WinePress of Words. Writing can be like playing the piano. To get good at the piano, first you need to learn scales and chords and technique. Then you learn how notes fit together and form compositions. Then you can experiment and play and create — and break the rules if you need to in order to get a good sound. To get good at writing, first you need to learn what words do and how they work. Then you put them into sentences and put the sentences into paragraphs. Then you can experiment and play and create — and break the rules if you need to in order to make a point, convey an idea or just make the language sing. But those first steps are crucial for both writing and music. Just as a jazz pianist improvising (usually) sounds a lot different from a child banging on a piano, a careful writer throwing out a grammatical rule for a reason “reads” a lot different from a novice writer who never learned grammar to begin with. One is effective, interesting, uplifting; the other is noise. For one, every note — every word — has a purpose, a reason to be there; for the other, notes — words — are used sloppily, randomly. A good writer knows the rules and understands why they’re there. A good writer also knows when breaking them is effective, and when it’s just sloppy. Happy National Grammar Day! And may all your rules be broken for a reason. I couldn’t agree more. The old adage that ‘Rules are made to be broken’ only applies if you know the rules and are breaking them positively and purposefully. It doesn’t apply if you break them through not knowing them.